A conference organized jointly by IDLO and the Italian Ministry of Foreign Affairs  on July 21st heard that the rule of law enhanced accountability, helping achieve sustainable development for all. The statement was contained in a message from UN Deputy Secretary General Jan Eliasson. His words – and those of John W. Ashe, President of the 68th General Assembly – opened the event at the Food and Agriculture Organization  in Rome. By empowering the poor, development economist and senior FAO official Jomo Kwame Sundaram  argued, the rule of law also helps realize food security. It could be instrumental, he said, in shifting the world’s focus from protection (ie, helping rural communities at times of deprivation) to production (ie, building resilience). At the same time, Prof. Sundaram warned against “reifying” or “fetishizing” the law: some law regimes could harm the poor through zealous enforcement of exclusionary property rights, for example. His comment was echoed by Ms. Khan, who drew a distinction between rule of law and rule by law. The essence of the rule of law, she stressed, was to ensure “substantive as well as formal justice”. For her part, Chair of the Committee on World Food Security  Gerda Verburg said there was a need for concrete indicators, reliable data and financial instruments to quantify the empowerment of the poor and vulnerable – including their access to food and services. In this, she echoed senior UN human rights official Flavia Pansieri , who argued forcefully that human rights and the rule of law were measurable concepts. Italy’s Vice Minister of Foreign Affairs, Lapo Pistelli, also extolled the role played by the rule of law in delivering socio-economic progress – and the importance given to it by his government. He was speaking against the dual backdrop of Italy’s presidency of the European Council  and the finalization of draft Sustainable Development Goals  in New York. 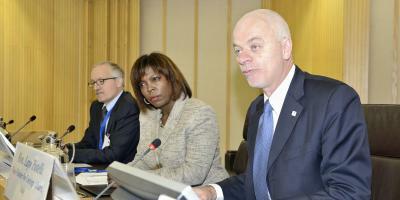 The World Food Programme ’s Ertharin Cousin also described the rule of law as essential. “We will not achieve zero hunger without good governance,” she said, adding that Syria’s civil conflict had set back development in that country by a startling 35 years. The rule of law was to be viewed as a transformative enabler, Italy’s Mr. Pistelli went on to add. Rome, he said, continued to believe that a specific SDG on good governance and the rule of law would be a “value-added product” in the post-2015 development agenda. Speaking for civil society, Ignacio Saiz of Brooklyn-based NGO the Center for Economic and Social Rights welcomed the SDG draft, even as he issued a word of caution. He called for rigorous targets that would not give “too much leeway” for adjustment or "too much deference... to what may be overly restrictive national laws."